Microsoft Money is a financial software package. Money files are used to create and manage accounting records. MS Money backup will let you to keep all you important data safe and secure. How to back up MS Money data? Your Money file extension is *.mny and it is usually stored in My Document folder. 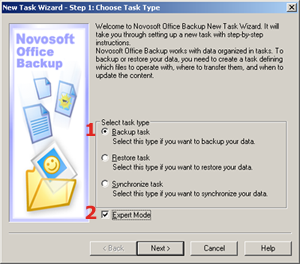 Novosoft Office Backup allows you to automatically back up My Documents folder. 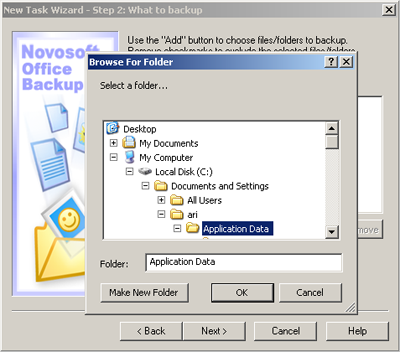 You can also specify the MS Money file extension in Step 2 of the New Task Wizard: What to back up (Expert Mode) and Novosoft Office Backup will find and backup all files automatically. Note: MS Money creates a backup copy on exit, but it is strongly recommended to make your own backup copy of your Money data. 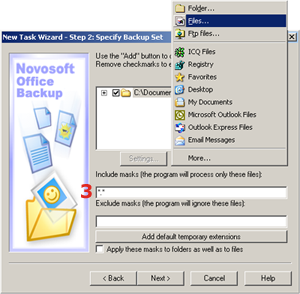 You can simply back up your data to DVD, CD, HD-DVD, Blu-Ray, external drives, FTP, SFTP or LAN using an Novosoft Office Backup program.